ensure the passengers a comfortable ride. Here is a detailed article on how a passenger vehicle suspension system works. A passenger vehicle suspension system contains many intricate parts including shock absorbers, strut assembly, coil springs, ball joints, steering linkage, stabiliser bar (sway bar), tie rods and C.V. joints. 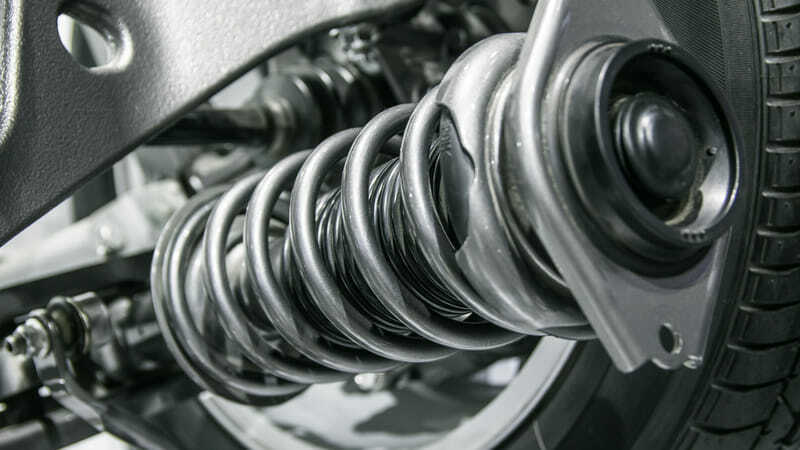 While each suspension system may vary, all suspension system components will weaken/wear over time through stress applied during normal driving conditions. However, off-road driving and erratic driving can cause suspension components to wear more quickly. Also, a major impact with a road hazard such as a pothole or curb may cause significant damage to the suspension with no visible indications. If you notice any symptoms of suspension problems give us a call, we’ll set you up an appointment and get your car in the shop ASAP. Preventative checkups are the key to sidestepping the effects of worn shocks/struts. Suspension system maintenance is essential for the safe operation of your car. If the roads you travel have many bumps (potholes) or if you are an aggressive driver, your vehicle may require repairs sooner rather than later. If you notice any of these symptoms be sure to call Hyack Excel Tire so we can inspect your car's suspension. Your steering and suspension system is made up of many components with complex interactions. Hyack Excel Tire's experienced mechanics understand your vehicle and can diagnose the problem quickly. These are the types of problems that may occur if your suspension system is not maintained regularly. Suspension issues that go untreated have the potential to increase the wear on other suspension components, which may result in more extensive repairs down the road. Call Hyack Excel Tire to book a Suspension System Inspection during your next vehicle service. Not all vehicles have both shocks and struts. Some have just struts, and some vehicles have only shocks. Shocks are part of the overall suspension, and a strut is a complete suspension assembly. The shock absorbers in your car aid in ride control by keeping the car manageable during regular driving. They do this by keeping the tires down on the road and not allowing them to bounce after hitting a bump. Preventative checkups are the key to sidestepping the effects of worn shocks and/or struts. This article by William Harris gives a detailed and easy to read explanation of the workings of a car suspension system. Double-wishbone suspension on Honda Accord 2005 Coupe. If a road were perfectly flat, with no irregularities, suspensions wouldn't be necessary. But roads are far from flat. Even freshly paved highways have subtle imperfections that can interact with the wheels of a car. It's these imperfections that apply forces to the wheels. According to Newton's laws of motion, all forces have both magnitude and direction. A bump in the road causes the wheel to move up and down perpendicular to the road surface. The magnitude, of course, depends on whether the wheel is striking a giant bump or a tiny speck. Either way, the car wheel experiences a vertical acceleration as it passes over an imperfection. Without an intervening structure, all of the wheel's vertical energy is transferred to the frame, which moves in the same direction. In such a situation, the wheels can lose contact with the road completely. Then, under the downward force of gravity, the wheels can slam back into the road surface. What you need is a system that will absorb the energy of the vertically accelerated wheel, allowing the frame and body to ride undisturbed while the wheels follow bumps in the road.